OLDRIGHTIE: Historic Agreement On Brexit Today. Historic Agreement On Brexit Today. Davis is thinking about how wealthy he's to become, Barnier puzzled he will get less than Davis. 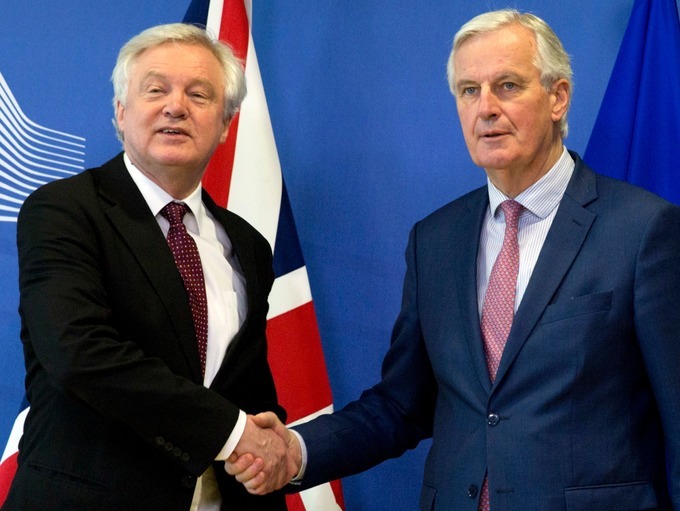 David Davis happily shakes hands on surrender of fishing industry, immigration, funding of EUSSR Army, unification of Ireland and renaming it the Gaelic State of Europe. A further plan to give all white owned farms and lands to Islamists and Ethiopian illegal refugees, to follow. Mr Davis said talks on the compensation and grants to UK Cabinet Ministers for surrendering their posts and the United Kingdom to unelected despots was so great an offer of untold wealth no right minded member of the UK political Establishment could refuse such largess. The very first President of The Federal State Of Englandistan is to be Lord Mandleson. An interim appointment until a more appropriate German figure can be found to take over. 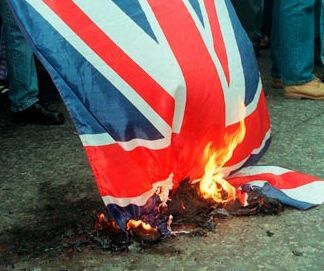 From immediate effect or at least by December 2020, British Armed Forces are to be disbanded and substituted by an EUSSR force. To ensure the hand overs and final rejection of the British will and referendum result are run smoothly, all UK wide policing will of immediate effect be devolved to the powerful EU riot police. Censorship policies and the dismantling of all but Islamic representation will be implemented. British, white endemic descendants not prepared to integrate with coloured partners will be offered deportation or imprisonment. Muslim grooming gangs will be legalised and no age limit be applied to their desired perversions and practices. Objection by all white or Hindu parents will initially be met with fines or thereafter imprisonment. Care homes for children will be hereon only be allowed, if staffed by Islamic men. Shelters for abused women will no longer be permitted. Wearing of Muslim garb is to be absolute on pain of stoning or beating by selected volunteers.